Bentleys Barn in Press, near Matlock, Derbyshire sleeps 4 people. 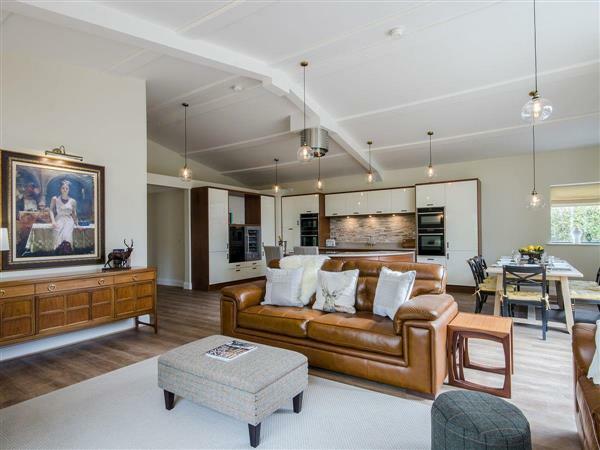 Bentley’s Barn near Matlock is a great example of an idyllically placed barn conversion situated on the edge of the small village of Press, near Ashover, and only 4 miles from the popular tourist town of Matlock. Beautifully placed in the village, this detached single-storey barn has been meticulously renovated to a beautiful standard throughout, and even has its own hot tub. The property exudes quality with a thoughtfully designed open plan living space, a fabulous kitchen area boasting granite worktops, two ovens, a steam oven and built-in coffee machine. The living area is comfortable and spacious with wood grain flooring, leather sofas and tasteful furnishings. Both bedrooms offer contemporary en-suite bathrooms one with a bath, and the other with a large walk-in shower; dressing gowns are also provided. With ample off road parking and a field with views over the countryside for outdoor games, as well as a private area with your very own hot tub, this property provides excellent accommodation with all the contemporary comforts you could wish for. Close by, in Ashover, there are local inns and village shops, whilst golfers can enjoy a round on the 9-hole course in nearby Stonedge, or on the Matlock golf courses. Ashover is one of the country’s largest parishes and has an extensive footpath network, with all routes coming back to the village. The surrounding area is wonderful for walking and cycling, or touring the pretty market towns and popular tourist attractions. Nearby Matlock, with its warm springs, offers interesting, independent shops, restaurants and tempting tea rooms, with Leys Hall Park providing a lovely setting for recreational activities such as bowls, tennis and boating. Chatsworth House and gardens are about a 15-minute drive away, Bakewell is 20 minutes, and Hardwick Hall and Haddon Hall are also both well worth a trip. With Crich Tramway Museum and Matlock Bath close by, there’s a wealth of activities for all. For birdwatchers and nature lovers, you can enjoy taking a walk around Carsington Water, along well defined paths. Come and enjoy this fabulous holiday home in this beautiful part of Derbyshire. Riding is 2 minutes’ walk away, and fishing lakes are within 5 minutes’ walk. The shop is 1½ miles from Bentley’s Barn near Matlock, with the pub and restaurant 1 mile from Bentley’s Barn. Ground Floor: Bentley’s Barn near Matlock is all on the ground floor. Open plan living space: With double French doors leading to courtyard. Living area: With Freeview Smart TV and DVD player. Kitchen area: With breakfast area, 2 electric cookers, NEFF steam oven, combi microwave/oven/grill, fridge, freezer, wine cooler, 2 dishwashers, coffee machine, washing machine and wooden floor. Bedroom 2: With twin beds and en-suite with walk-in shower and toilet. Air source central heating, electricity, bed linen, towels and Wi-Fi included. Welcome pack. Catering and celebration cake (available by prior arrangement directly with owner) Lawned courtyard with decked patio and garden furniture. Hot tub for 6 (private). Private parking for 4 cars. No smoking. Holidays at Bentleys Barn run from Friday to Friday. Pets allowed at Bentleys Barn. For a better idea of where Bentleys Barn is, you can see Bentleys Barn on the map below. Bentleys Barn is in Derbyshire; should you be on the lookout for a special offer, you can find all the special offers in Derbyshire. It's always worth checking to see what is on offer at the moment. Do you want to holiday near Bentleys Barn (UK4087), you can see other cottages within 25 miles of Bentleys Barn; have a look to find your perfect holiday location.